The Government likes to talk about America’s addiction to foreign oil. With their acquisition of General Motors the administration had an opportunity to force GM to move in a more “green” direction. We certainly know that they already possess the technology. It is not surprising that they chose not to act on it, rather they chose to bilk the taxpayer out of billions of dollars to retool their manufacturing facilities to produce the their new green car. One provision in the “Bail Out Bill” allocated some $25 Billion for automakers with few strings attached. The plan only required the money be spent to retool and develop fuel-efficient technology for vehicles. Since the auto-manufacturers have already spent millions in developing fuel-efficient technology this would free up bailout funds to be used as they see fit. Keep in mind that General Motors already manufactures natural gas vehicles but they are not available in the United States. GM instead exports that product line to Europe, Asia, South America and elsewhere, just not in the USA. At an auto show in Switzerland General Motors CEO Rick Wagoner discussed GM’s efforts to improve foreign markets for their natural gas product line. If there is a natural gas vehicle already in production why is the taxpayer on the hook to have it produced for the US market and where is the justification of the dollars required to do this? GM has not been forthcoming and fair with the US consumer. GM was involved in the scandal surrounding the EV1-the electric car that was secretly shredded after California lifted its’ zero emissions mandate in the 1990s. 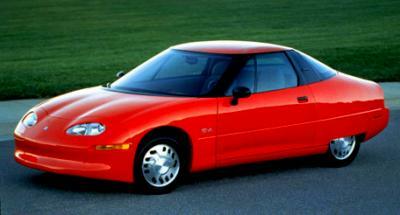 The EV1, a plug-in car, was capable of 110 miles on a single charge. Many Hollywood types such as Tom Hanks were given the opportunity to test the vehicle over a two-year period as part of a GM sponsored lease program. When the lease expired the cars were returned to GM and subsequently destroyed. GM citing the vehicle was too expensive to manufacture denied several celebrity end-of-lease purchase attempts. As a side note to the EV1 debacle there was a new battery technology developed which GM acquired ownership of. When the EV1 program was squashed this new battery technology was sold to Texaco Oil who has chosen to "shelf" the battery. It seems doubtful the advances in this particular battery technology will ever surface again. GM now touts the Volt – a plug-in hybrid with pitiful sales so far – as the successor to the EV1. Remarkably the "so-called" successor reportedly gets a dismal 40 miles on a charge and after the battery is depleted it becomes a standard hybrid relying on a gasoline powered engine. Hard to believe that GM had a winning design way back then and now they have a poor design that gets less on a charge for much more money.